How long does a damp survey take ? How long does a damp survey take? Our damp surveys usually take between three to four hours depending on various factors. But the real answer is – until we find the problem ! This can take all day sometimes. Over two hours were spent in the subfloor area of this property during a survey, following the trail; Michael spent six hours at the property in all. You might hear the expression ‘following the trail’ used by surveyors. It means following the information trail using our senses and our equipment to lead us to a defect, which enables us to work out the remedy. A couple of remedial surveyors had both recommended chemicals to remedy an outbreak of dry rot ( surpula lacrymans ), one price was to the tune of £1300. Dry rot needs a moisture source and its a myth that it will be caused by a lack of subfloor ventilation alone. The truth is – find the cause of the moisture and ‘ turn off the tap’, ventilate the area and the dry rot will die. The £1300 of chemicals would have been a waste of money and there would have been a serious risk of a further out break of dry rot as the moisture source had not been addressed. 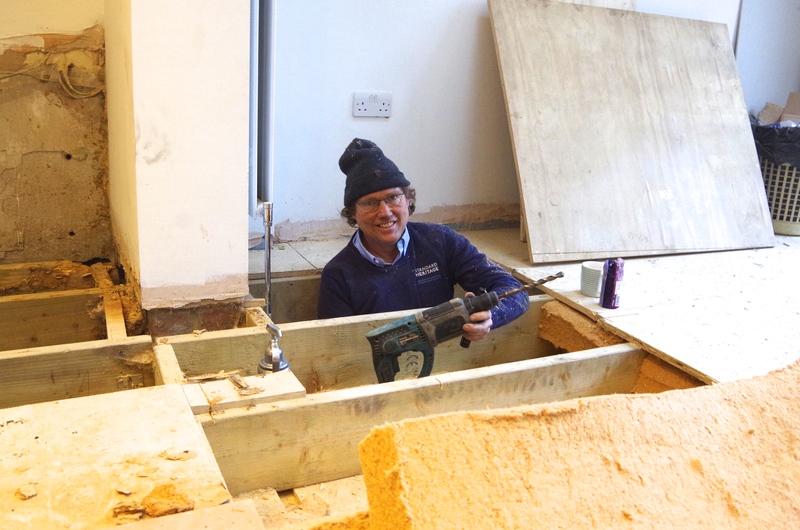 Standard heritages principle surveyor – Michael Foley – getting to the bottom of an issue – literally !